Benannt nach dem natürlichen Schatten, der von 29 Kokospalmen auf dem Grundstück bereitgestellt wird, bietet unser Strandhäuschen 2 Schlafzimmer, eine voll ausgestattete Küche, kostenfreies WLAN, Kabelfernsehen und ein lokales Telefonservice. Die 300 Quadratmeter großen Deck ist buchstäblich nur wenige Schritte vom Wasser und hat immer Schatten zur Verfügung, um aus der heißen Nachmittag Sonne der Karibik zu bekommen. Genießen Sie die starken, übergroßen bequemen Hängematte zwischen Palmen unseren aufgereiht. Große Schnorcheln ist direkt vor dem Haus zur Verfügung und zahlreiche Tauchplätze sind innerhalb weniger Minuten. Zu Fuß zu La Esperanza Eatery & Bar oder gehen Sie die entgegengesetzte Richtung in die Bäckerei, und ein weiteres kleines Diner. Unser Hausverwalter wird Sie am Flughafen abholen, Sie zum Cottage begleiten und Ihnen bei allen Bedürfnissen helfen. Neue Küche und Bodenbeläge im Januar 2019 installiert. Nutzen Sie unsere friedliche Paradies! Beautiful home. Everything you will need for cooking, snorkeling, laundry, and relaxing. Great neighbors. Friendly owner and helpful assistance when we needed it. I really enjoyed my stay at 29 palms. I had an amazing time on the "BRAC" as the locals call it. Nice laid back setting that's very care free. These wonderful people are just living no worries I loved it and how friendly and helpful they all were. I would definitely recommend this place and will definitely be back. Thx to Teri and Carol lol and my guy Mossy amazing fellow and very helpful. Thank you James for the wonderful review. I'm so happy you enjoyed our relatively unknown little piece of paradise in the Caribbean :-) It was a pleasure to have you as our guest and we look forward to having you stay again. Loved everything about this property, from the initial contact with the owner through VRBO to sleeping to the sound of the ocean right out the screen bedroom door to the local surroundings... Terri made sure we were well taken care of with numerous emails, guest information, numerous contacts in case of emergency. The cottage was in perfect condition, comfortable, clean, and access to everything we needed. We felt as if we were part of the family. Lovely stay. This cottage was more than we could have ever hoped for. From the moment we collected our luggage and met our enthusiastic property manager, we knew the trip was going to be awesome! The cottage was the perfect size for our family of 4. The kitchen had a view of the ocean and the master bedroom led out to the deck. We enjoyed exploring the islands caves and trails as well as wading through the tidal pools with our children looking for fun sea creatures and shells. Every morning started with coffee on the deck and our day ended with watching the sunset with a beer. Would absolutely stay here again! Thank you so much Valene for your review of our little piece of paradise :-) So happy to hear your family had a wonderful time exploring Brac. We'd love to have you come stay again anytime! The cottage is very comfortable for two people, perfectly located right on the water, and very well equipped. Loved listening to wind and waves and sitting on the deck or under the palms. Our only complaint was the traffic that goes right by the front of the house. Often honking and revving of engines. Owner Teri and manager carol are very welcoming! Thank you Ann for your review. The Cayman Brac residents use their horn for saying hello so that's what the honks were about. Not sure what was going on with the revving of engines though. Happy to hear that you had a relaxing time over all. We hope you'll consider staying with us again if you return to Brac. I had a wonderful stay at 29 palms - the cottage had absolutely everything you couldn’t need on holiday. While I didn’t have great weather and the water wS a bit rough th for swimming - it’s really close to some great walking tracks. Thanks everyone for your hospitality!! Thank you Adele! I hope you meant that it had everything you "could" need :-) We try really hard to ensure the cottage is well supplied. 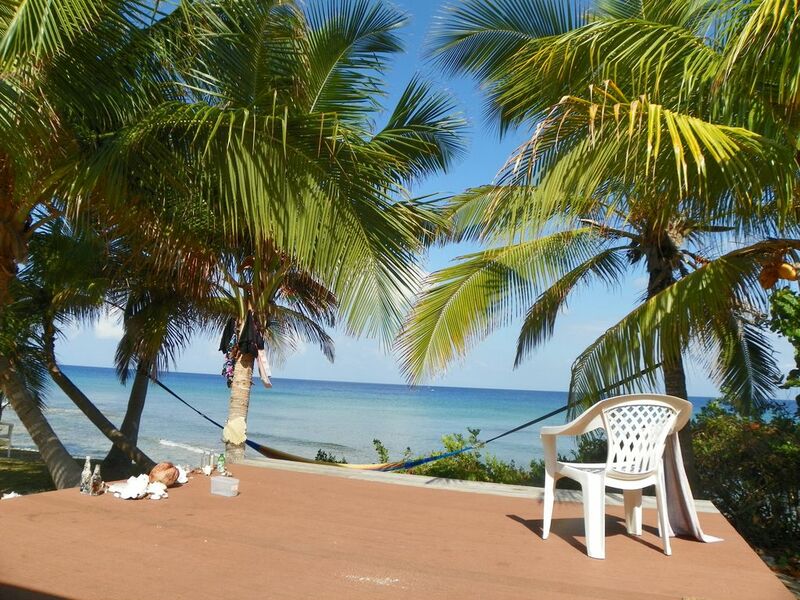 Happy you enjoyed your time on peaceful Cayman Brac.